"Very impressed with the whole Ayers Basement Systems..."
By Edith & Ruby S.
"They were great, very courteous!" By Bob & Kathie P.
"Professional and alert. Good representation of Ayers." No matter how hard you try to ignore it, your crawlspace is a part of your home and has a large effect on what kind of air you breathe inside. Moisture and humidity create an environment for mold growth that can threaten the health of your home. The CleanSpace vapor barrier completely stop moisture from getting into your crawlspace. Bowing walls can be hard to spot early in their transition. A slightly bent wall doesn’t look that different from a normal wall to the untrained eye. That was what happened to this homeowner. After purchasing his home one year ago, he began to notice horizontal cracks running along the walls. These sort of cracks, especially multiple ones, are a sign that there is added pressure on basement walls and they have started to bow as a result. On the positive side, the bowing hadn’t affected any of the other walls - which is a common problem when foundation settles. Almost just as lucky for the homeowner, PowerBrace exists! PowerBraces are a unique support system used by Ayers Basement Systems, that are perfect for repairing bowing and cracked walls. PowerBrace steel beams are attached to the floor joists in the basement ceiling and buried into the foundation floor. Repairing this severely bowed wall required 8 different PowerBrace beams. The beams are zinc coated steel and can be tightened, so they will continue to straighten the walls over time without the possibility of rust or mold. Let us know when you get tired of fighting your bowing walls and we’ll tag in the PowerBrace system! Water coming in basement. Unfinished block with cement slab. We recently purchased our home. There is a large egress dug out for two separate/adjacent rooms in the basement. The retaining wall is wood posts & boards and there is some bowing taking place in the retaining wall. There may also be some bowing where one of the retaining wall supports attaches to the foundation of the house. The home as a wooden foundation. Basement flooding. Water is coming up through the floor. Have lived in our home for 23 years(1995), and at the 19th year this flooding started each spring, making this the 4th. THis basement was finished and we lost all of of it. We have tried everything we can think of and are now seeking help. Crawl space needs in house needs insulation. I have a relatively small leak in my basement, in a closet, under the fire place. I have tried to repair with over the counter products but no luck. Time for the professionals. We are interested in sealing/water proofing our crawl space. Need new access door replacement. It has been 35 years now that Ayers Basement Systems has provided Gaylord homeowners with professional basement waterproofing and foundation repair. We are a locally owned and operated business that built a reputation of high quality work and complete customer satisfaction. We work with both businesses and homeowners in Gaylord who need foundation repair, basement waterproofing, crawl space repair and concrete leveling. I you have water or moisture in your crawl space or basement it is likely that you will end up with mold and rot. Ayers Basement Systems can protect your home from these problems with proper basement waterproofing and crawl space encapsulation. We are members of Basement Systems international network of waterproofing contractors. As part of this network we receive advanced training as well as access to proven, patented waterproofing products. Our complete waterproofing system comes with a lifetime, transferable, dry-basement warranty. We use a patented interior basement waterproofing system that permanently protects the space from mold and rot. A drainage channel is installed along the perimeter of the basement. The channel sits below the concrete floor and collects any entering water. The water is channeled to a sump pump which pumps it out and away from your home. 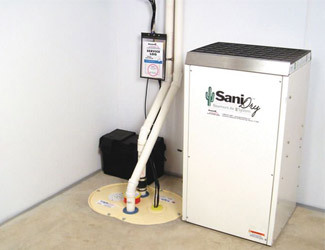 An energy-efficient basement dehumidifier is also installed to keep the relative humidity low enough to prevent mold growth. The entire system is hidden from view but keeps your basement dry. Not all homes have a basement, but Ayers Basement Systems also works in crawl spaces. We encapsulate the entire crawl space with a insulating matting and thick, vinyl vapor barrier. The crawl space vents are sealed and a new entryway is added. The encapsulation keeps water and moisture out of the space. A specially designed crawl space dehumidifier and sump pump is added. The whole system keeps the the space dry and mold free. It also prevents cold floors over the crawl space. Foundation problems need to be quick and professionally fixed. Ayers Basement Systems repairs and restores foundation and have successfully helped hundreds of homeowners and businesses throughout Michigan & Indiana, including in Gaylord. We have the right tools for your particular foundation issue. 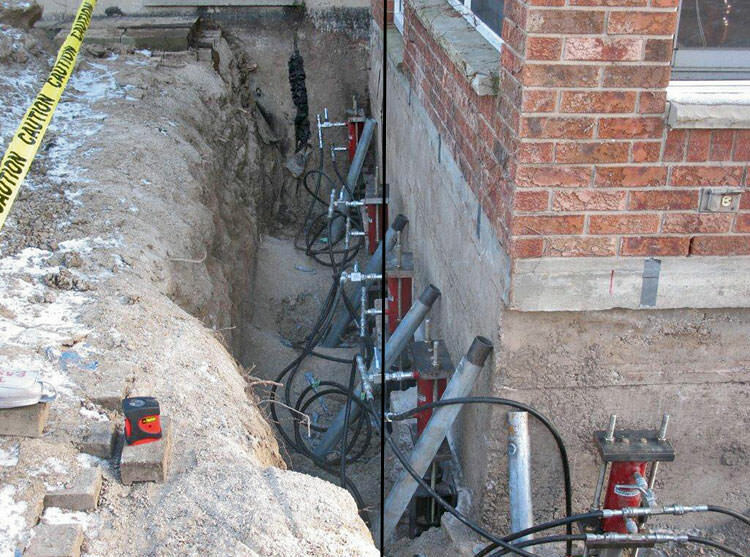 We fix settling foundations using foundation piers that are drilled down to load bearing soil. The different piering systems include: helical piers, push piers, slab piers and helical deck piers. For bowing basement walls we offer wall anchors, wall stabilization systems and sprayed concrete. If you have a sagging floor over your crawl space our installing support jacks solve the problem. Whatever particular foundation issue you are facing we have a solution. We can lift and level sunken concrete slabs around your home. This means we can fix sunken and cracked sidewalks, driveways, pool decks, garages and more. To fix sunken concrete we use and updated form of mudjacking. Traditionally mudjacking (aka slab jacking) requires a series of holes to be drilled in the concrete slab. A thick, pressurized mudslurry is pumped under the slab through the holes. The pressurized mudslurry lifts the concrete back to its original postion. We do the same thing but use PolyLEVEL, an expansive polyurethane foam, rather than mudslurry. PolyLEVEL is superior because: it is sprayed through much smaller holes, expands to fill the space, is much lighter (less stress on underlying soil) and cures in hours rather than days. If you need concrete lifting and leveling services in Gaylord, we are the trusted expert. With the egress windows that were the biggest water culprits, even a new window wasn't going to solve the problem entirely since cracks had already formed. But by installing a WellDuct, we can direct any water right into the WaterGuard, and therefore the sump pump. A view from above into the new well and the outer portion of the Well Duct, which will help the water drain into the WaterGuard system. Not only is this egress window properly installed, but the accompanying lid will prevent that garbage aquarium from creeping up. This customer called us because he wanted to level out the uneven sidewalk leading up to his home. We used the PolyLevel system to raise and level the settled concrete and prevent it from sinking again in the future. This system used lightweight polymers that were injected into drilled holes in the cement slabs. The polymers were dense enough to expand and lift the slab, but light enough to address the weak soil issue that caused the sidewalk to sink in the first place. Patio about 40 feet long with one of the middle sections sinking about 1 1/4". Photos available. Thanks. I have block walls in my basement that are bowing. We have a small "Michigan" basement that has some mold/leak issues. We would like to get this sealed.